"This is Duke. He is a mix of a Tibetan Spaniel / Mini American Eskimo, or as I like to called him, a Tibasko. Duke is more than loyal to me; he is obsessed! He will stay up as long as I'm up, and sleep until I wake up (no matter how long). He is a happy dog and tries to play with his two cat roommates, who for the most part, hate him. Overall, Duke is my best friend. He makes the end of my day a happy one." 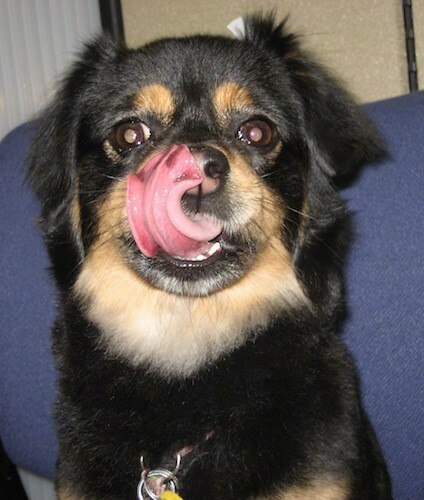 "This is Colette, my Tibetan Spaniel mix. People sometimes think that she is a Rottweiler puppy at first glance because of her black and brown coat but when I tell them that she is 2 years old and fully grown, they can't quite figure out what breed she is. This picture was taken when she was 18 months and she was just groomed. She was sitting in my office and was just having a great time. She is very welcome to come to my workplace as everyone loves her because she is so sweet. But for some reason, she hates bicyclists, skateboarders and people wearing hoodies. It doesn't matter what she is doing or where she's at, but when she sees any of them, she barks like hell."